Carpet cleaning in Woodinville,Wa. Many homes and offices have carpets which protect the flooring, blend with the interior decor of the room and also cushion the feet from impact with the floor. However, since feet or footwear are in contact with the ground outside the home or office, the footwear gets dirty and some of this dirt gets scattered on the carpet, when the person enters the room and walks on the carpet. Also when food or liquid spills in the room, it can fall on the carpets also causing stains.Most of this dirt on carpets is dry dirt, especially in summer, but during wet weather like heavy rains, and winter, the dirt can be wet dirt including muddy clumps which could also discolor the carpet. While most homes and offices have a provision to remove the dry dirt on a carpet using a conventional vacuum cleaner or cleaning device, a large amount of stubborn dirt still accumulates on the carpet.Hence both homes and offices in Woodinville,Wa. 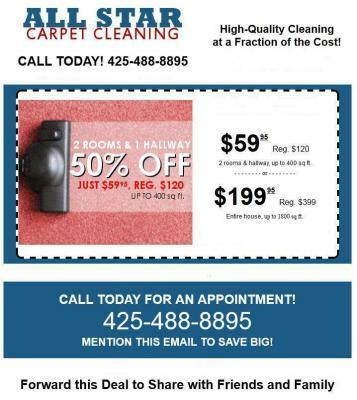 use the services of a firm specializing in commmercial and residential All Star.Carpet Cleaning in Woodinville,Wa. cleans their carpets thoroughly. Cleaning the carpet is required as the bacteria and other microbes which flourish in the dirt of the carpet can cause harmful diseases. The cleaning frequency depends on the size of the carpet and how much traffic.. Carpets in the lobby of a hotel or building will get dirty more quickly, and hence monthly or every couple months cleaning may be needed. In many cases, a contract will be signed with the carpet cleaning firm, which specifies the standards which should be followed, rates and cleaning frequency.This carpet cleaning firm has both the specialized tools and equipment as well as expertise necessary to remove the dirt from the carpet. The time required to clean the carpet will depend on the size of the carpets. Many carpet cleaning companies use steam cleaners which will thoroughly remove all the soil which is embedded in the carpet as high pressure heated steam will remove all the dirt from the carpet and other surfaces.